The company that delivers my milk, Oberweis Dairy, has introduced a new service. They will deliver fresh fruits and vegetables with your weekly milk delivery. On the 1st, which was my delivery day, they left me a small box with a free sample of the kinds of things they will be delivering. As things go in my house, I didn't get around to opening the box until this weekend. In the meantime, I've composted some lettuce and a red pepper. I need to clean out the vegetable drawers and add the overripe contents to my compost pile. I figured whatever was in this box would be soggy and soft even though it's been in the fridge since I got it. 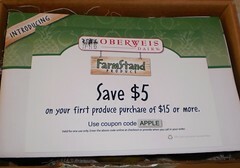 I opened up the box and here's a nice coupon. Maybe next month I'll take advantage of this. There are many different kinds of boxes you can get. Since my delivery is on Thursday, in theory, the fruits or vegetables will only sit in the fridge until the weekend. They have an all berry box which is appealing. I could get berries and make muffins or just sprinkle them over vanilla ice cream. Mmmm...blackberries over vanilla ice cream. I could eat that for supper. I opened the top, expecting soggy peppers, an onion, a zucchini and an eggplant, something I have no idea what I'd do with it. Imagine my surprise when it turned out to be fruit. 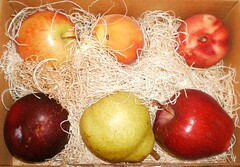 That's a "gala"-like apple, a peach, a white plum on top, followed by a red plum, a pear and a red delicious apple on the bottom. The fruit was still firm with a good aroma. Now, I'm not a peachy person. Peaches are not something I gravitate towards. I can make a dynamite peach blueberry cobbler, but only if I have company coming. It's not something I'll make for myself. But I didn't want to summarily chuck this into the compost pile. I should give it a chance to impress me. 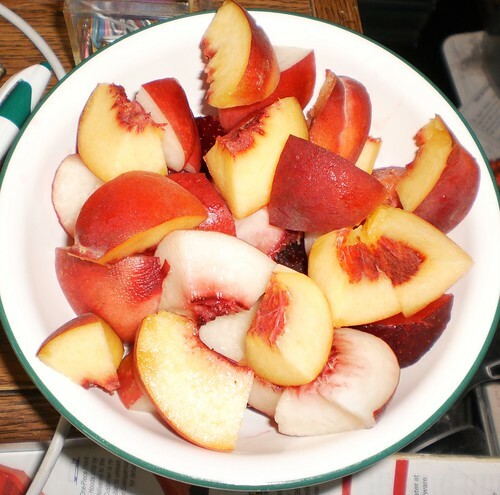 So, I cut up the plums and the peach into finger-sized chunks. I was doing uploads at the computer in between other tasks and wanted something to nosh on. These were delightful. The peach was sweeter than I expected it to be. I'm going to have to look into white-flesh plums. I've never had one before and it was better than the red plum which I like. I could see making a tart with both of those kinds of plums. That would be luscious. Bottom line is that I think I will give this a try, but not until next month. I'll have to weigh the cost of a box versus the cost of buying this at the grocery. With a grocery store a 3 minute drive from the office, the box is going to have to be really fresh to win me to this method of buying my fruits and vegetables.